From Our Hearts: OBS is a well oiled machine. Every time they cater at our location, I know I can rest easy that they will turn out professional service with incredible quality. They are fantastic in making each couple feel like their day is not just another day at the office, but an opportunity for their company to share in something special. How They Stand Out: We are a full service, all inclusive alcohol caterer. We specialize in bartending and optimizing your beverage experience. We can assist in design and planning, while offering personalized signs and banners through our own print shop. In addition we now offer more personalized bar set ups to tie in with your wedding decor. Most of our bartenders have been working in the alcohol catering service industry for 5-­10+ years. Their experience offers a unique ability to see your vision and adapt to each special event easily. This not only makes our client happy, but their guests as well. Something Extra: Oregon Beverage Services has been voted BEST in the Willamette Valley. We have been in business for 30 years. Between the owner and staff, we have a 100+ years of experience. Event Coordinator ­ Heather, has been with OBS since 2002 and Kristi has been with OBS since roughly 2004. Both have worked in the special event industry and management of special events collaboratively for 20+ years. Coordinating some of Oregon’s largest festivals and events, down to dozens of weddings each year. We work closely with our distributors, allowing us access to products you can’t always find in the store. We also love creating you personalized signature drinks that match your wedding colors, as well host an appropriate name for your special day! Piece of Advice: When you are planning your special day you want to make sure you always hire the best people in each field, to ensure everything goes as planned. 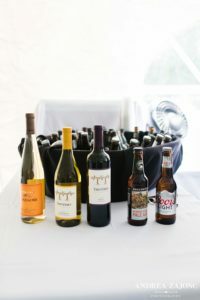 Specializing in Alcohol Catering, you would not want to trust us to handle other aspects of your event, such as preparing food or taking photographs. I have often heard stories where brides have went with a more affordable option and only realized why they were saving so much money on their special day. DO ask for special deals or creative ideas on bringing the cost down. We offer a lot of creative solutions to help fit our service into your budget. Lastly, there are smaller details that you often think are really important, only to find later that they were not as important as you thought. Remember, it is the vows and celebrating your new life with family and friends that is important. No one is going to remember where you had paper plates or clear plastic beverage cups. They will remember the smile on your face! From Their Hearts: We absolutely love working with The Water Oasis. Their level of professionalism and experience in the industry is something rare to find. Not only is their venue gorgeous, their staff is on top of things! My first time visiting the venue, I was blown away! Every detail is seen to and they show great pride in what they do. Rhiannon is a dream to work with and we are genuinely happy to have built a relationship with her and this amazing place. We always look forward to weddings and events at The Water Oasis! What a Deal! : We offer special package pricing, just for people who book at the Water Oasis. Please inquire for for your special pricing!